Or should I say Happy Wet Wednesday? Here at Maroney Real Estate just South of Murfreesboro, it sure has been a rainy day. A good day to catch up on some professional reading and writing. Buying or Selling, Call Maroney Real Estate! A few news headlines today were talking about candy. Perhaps because February 14th is right around the corner?! From those headlines I read about the Spangler Candy Company purchasing Sweethearts & NECCO Wafers in 2018, but the famous conversation hearts won’t be available this year for Valentine’s Day. Brach’s has their version of the same thing. I remember buying the little pink box for my daughters most years when they were younger. I guess I won’t buy them for the kids this year. Though I did see some on Amazon! Reading this article and reminiscing on the past, it got me thinking how things can change and you never know when it will happen. Like the housing market. (Of course my brain went there!) I wonder how it will change in 2019? 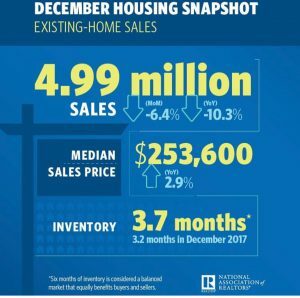 This housing snapshot from NAR (National Association of Realtors®) on Instagram shows the December housing snapshot of existing home sales is down and shows what we have been feeling this past year in Middle TN … that we do not have a full inventory. It’s been a strong seller’s market in 2018 here in Middle TN. What will the market look like during spring of 2019? 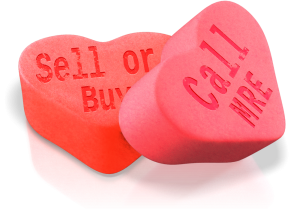 Buying OR Selling … Maroney Real Estate is here to help make YOUR 2019 dreams a reality. We’ll help navigate the waters of buying or selling, no matter what the market. Next Next post: What About Home Sales in Bell Buckle? What About Home Sales in Bell Buckle?